Normally when Jen is out of town I take that as an opportunity to either to make some stupid bachelor cuisine or just to clean out all the Belgian beer in the fridge. However, there are so many vegetables and leftovers in the fridge that I must continue on our normal race against time to use them up before they spoil. Lately my first courses have consisted of particularly unhealthy substitutions for salads so I really wanted to keep that trend alive. I took some of the leftover pesto from the other night and mixed it together with some ricotta cheese and smeared it on some sliced of ciabatta which I'd grilled with a little butter and olive oil. 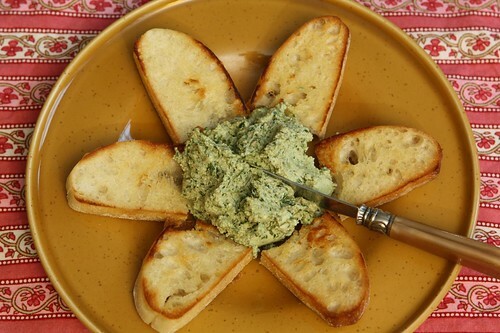 Since the pesto had no cheese in it to begin with the ricotta lent a nice creamy element to this and it was delicious served on slices of grilled ciabatta. I got a nice piece of freshwater catfish, seasoned it with a little salt, pepper, and Old Bay, drizzled some lemon on top and then pressed the remaining zucchini cake mix on top of the fillet. I browned this, zucchini side down, in some butter and olive oil then flipped it and finished it in the oven for about fifteen minutes. 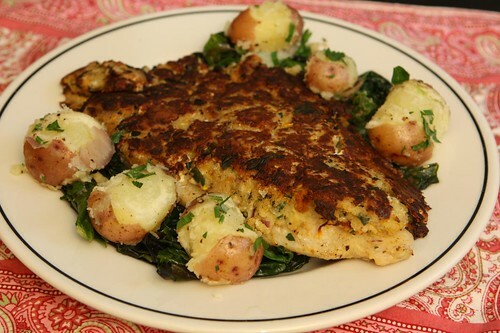 The crust kept the fish nice and moist and it was delicious along with the remaining farm spinach sauteed with garlic and some boiled new potatoes with butter and parsley. The zucchini cake mix worked exceptionally well as a crust for the fish. I'd highly recommend anyone use a similar technique for leftover mix for a fried vegetable cake of some sort. 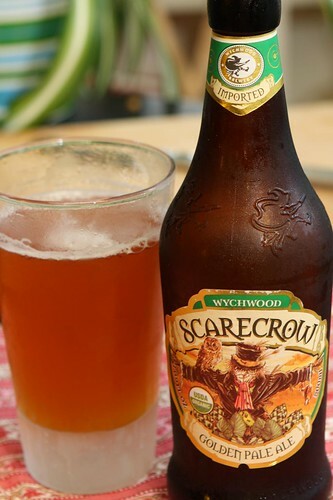 To wash this all down I reached deep into my beer library and selected this Scarecrow Golden Pale Ale from Wychowood Brewery in England. This is by far the finest Wizard of Oz character-themed beer I've had in the last ten years. No exaggeration, folks. So, you ask, if Jen is out of town what is the point of doing a bunch of stuff you'd do even if she were there? Well, I have been listening to Jethro Tull for the last hour and a half. delicious catfish I beleive is an oxymoron. The zucchini as wrapper is a keeper though.